The wireless headphone market has been shaken up so much recently that it's hard to know where to begin when a new entry appears on the stage and announces itself as the next big thing. 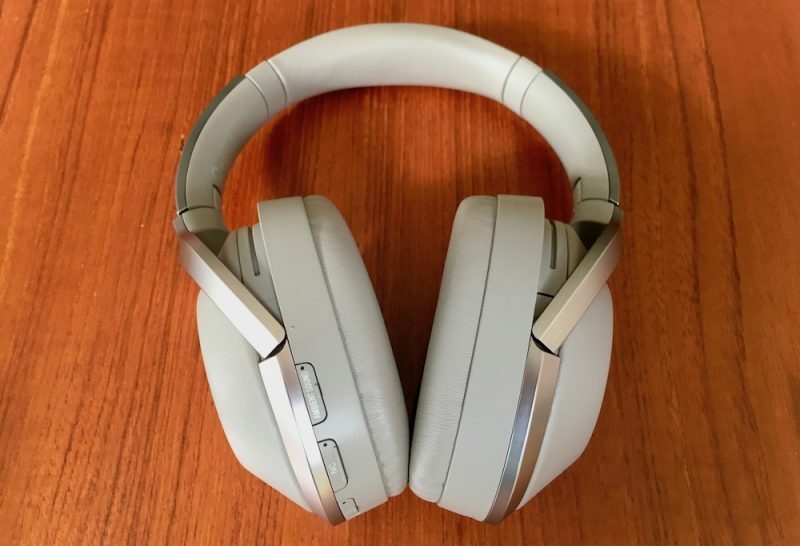 Fortunately this latest Bluetooth offering from Sony is targeting a very specific market segment best referred to as "premium noise cancelation", and the company seems pretty confident that with the MDR-1000X headphones ($400), it has got a hit on its hands. 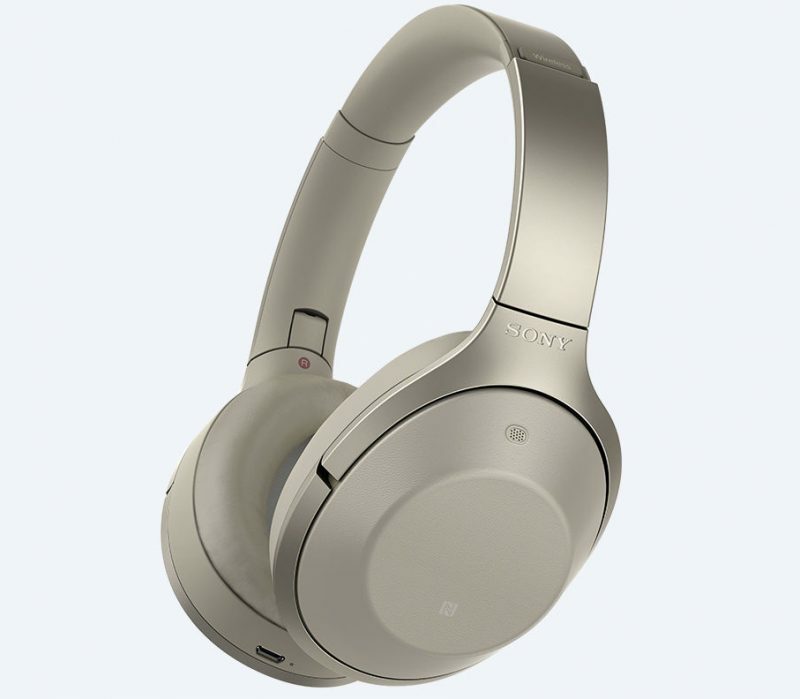 Sony is claiming "industry-leading noise cancelation" with these luxury cans, which use ostensibly the same drivers as last year's highly regarded MDR-1A headset made for listening to Hi-Res Audio, as supported by the company's audiophilic Walkman range, not to mention its line of wireless home speakers and in-car audio systems. Can it improve upon the finely honed features of Parrot's Zik 3.0, Bose's QuietComfort 35, and Sennheiser's PXC 550 Wireless noise-canceling headphones? Let's take a look. 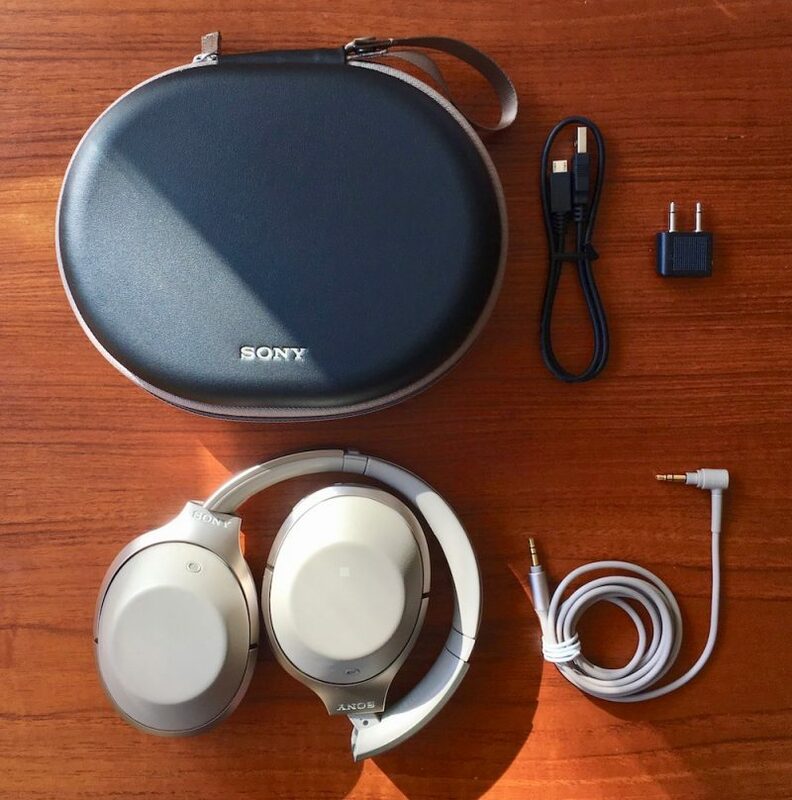 The Sony MDR-1000X's come in a box design and hard carry case that will seem suspiciously familiar to Bose QC35 owners, but that's where the similarities pretty much end. I received a beige pair (also available in black) that came with a nice thick matching 1.5 meter cable sporting a gold-plated mini jack, along with a black micro-USB charging lead and an airline adapter. The swivel-folding earcups and pivots are made of a robust, creak-free plastic, with champagne-colored rims and squishy earpads covered in smooth synthetic leather that's pretty convincing to the touch. 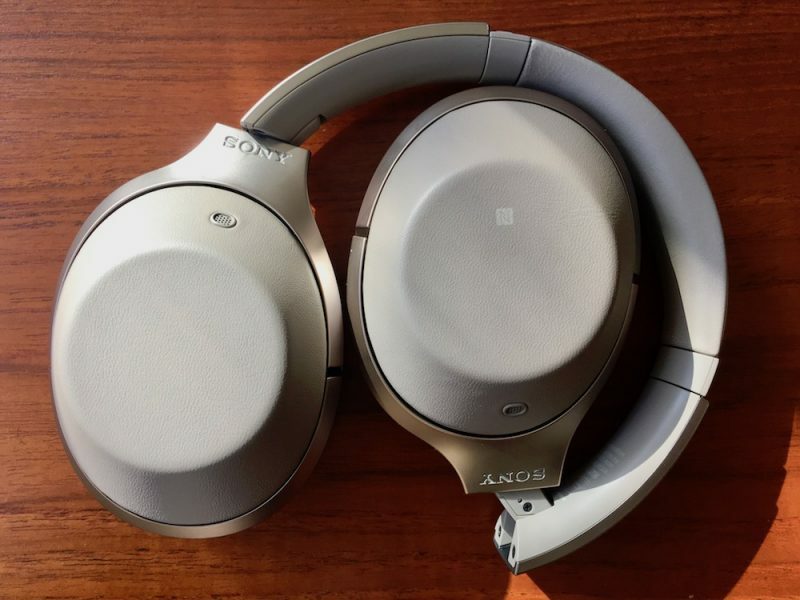 The polished steel headband packs some decent padding between the adjustable slats, and Sony has decided to let the design speak for itself by keeping the branding relatively understated. The only other distinctive mark on the outside of the cups are two small grilles where the noise-canceling microphones live. Altogether the headset weighs 275 grams, so slightly lighter than the QC35's (309g). The left earcup contains an NFC chip for pairing with compatible devices and a micro-USB port for charging, while the right earcup has a touch-sensitive back that responds to taps and swipes to control music playback, skip tracks, change volume, and invoke Siri. Like most modern headphone gesture pads, it can also be used to take and end calls. Around the rim of the right earcup are three physical buttons and an input jack. Unfortunately these controls aren't particularly textured or distinctive, so expect some fiddling when you're wearing the headphones before you get used to where they sit in relation to each other (although voice prompts helpfully accompany each press). The Ambient button lets you choose between different external sound filtering modes which we'll cover below, the NC button lets you turn noise canceling on and off independently, while the power button can be pressed quickly for a battery level update and also activates the pairing sequence with a long press. All of the buttons have inset LEDs to indicate status. It's worth stating right off the bat that Sony has taken noise cancelation to a new level with these headphones. This seems to have been achieved through a sustained period of self-reflection and extensive acoustics research in light of earlier shortcomings, combined with an exhaustive exercise in technological oneupmanship. In other words, Sony has pulled out all the stops in an attempt to beat Bose at its own game. To begin with, Sony has chosen a headset design with a firmer grip than its NC rivals so that the earcups alone do a better job of isolating you from the outside world. 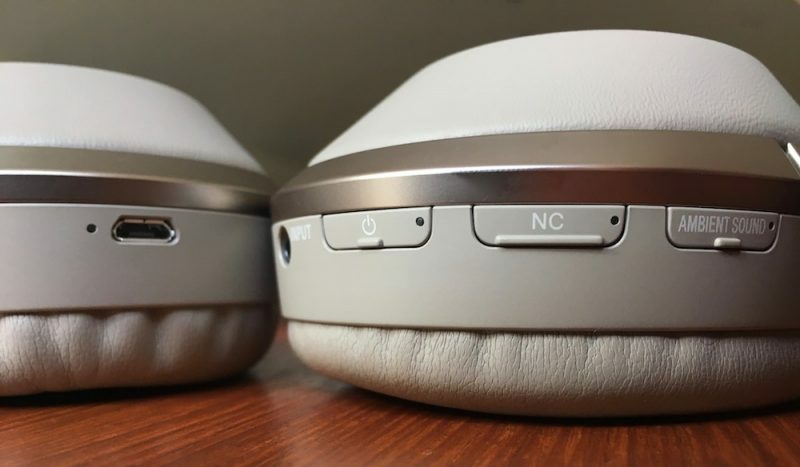 There's a slight trade-off here – Sony has used thicker urethane foam earpads than those found on Bose and Sennheiser's NC cans to improve passive reduction, and they don't feel quite as plush against your head as a result. 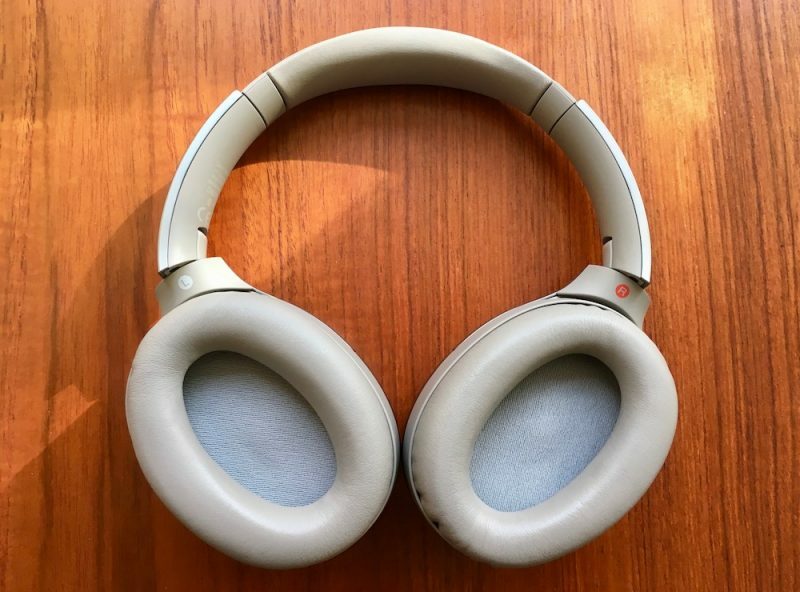 It's not a deal breaker by any means – they still feel lovely and squishy, and never bothered me after several hours of listening, but a few minutes back with the QC35's was all it took to confirm they do lack the latter's sumptuous cushiness. Second of all, Sony's patented Sense Engine boasts a "personal NC Optimizer", a fancy-sounding piece of tech that's supposed to determine your individual characteristics and wearing style to optimize the audio output just for you. Basically, Sony had the bright idea to build a microphone within each ear cup, which means the headset can sample ambient noise from both inside and out, effectively canceling out a wider range of sounds with corresponding inverted frequencies. Hold down the NC button, and the headphone speakers emit a series of tones that bounce back and forth between the mics to analyze the shape of your head, work out whether you have big hair, wear glasses, and so on. It's a unique innovation from Sony in the NC space – and it works, too. The only minor drawback for some wearers will be the ever-so-slightly more noticeable hiss when no music is playing. I found it pretty relaxing, kind of like distant lapping ocean waves. Your mileage may vary. Otherwise, the NC easily stood up to scrutiny in a range of environments, including a busy bus and a crowded shopping mall. It didn't detract from calls either, and effectively piped in my own voice as part of the conversation. The filtering is adaptive too, and corrected for changes in ambient levels as I moved around. These are also the first pair of noise cancelers I've worn that completely blot out my heavy-handed keyboard tapping and reduce my house phone in the same room to a barely audible, faraway whisper. You don't even need to take off the cans to realize just how effective the technology is, thanks to another feature unique to the Sense Engine called "Quick Attention". Cupping your fingers over the touchpad instantly turns the volume down and lets in the outside world, allowing you to engage someone in conversation. Bring your hand back down and the music is re-instated to its prior volume. It's genuinely useful for situations in which you'd usually be apt to take off the headphones – when a fight attendant offers you refreshments, for example. The MDR-1000X's Ambient button performs two further NC sound tricks. One is called "Voice mode" and lets in the range of sound frequencies the human voice normally occupies. This is also meant to let you hear in on important announcements – when you're waiting to be called to a boarding gate, say – while still allowing you to enjoy your music in relative quiet. I found the feature a bit overly enthusiastic, sometimes failing to filter out other ambient sounds like the rustle of bags and suchlike which then became exaggerated and annoying. The "Normal" ambient mode on the other hand worked very well, and let me stay mindful of traffic sounds as I walked the street without entirely extinguishing that insulated cocoon feeling that good NC cans do so well. 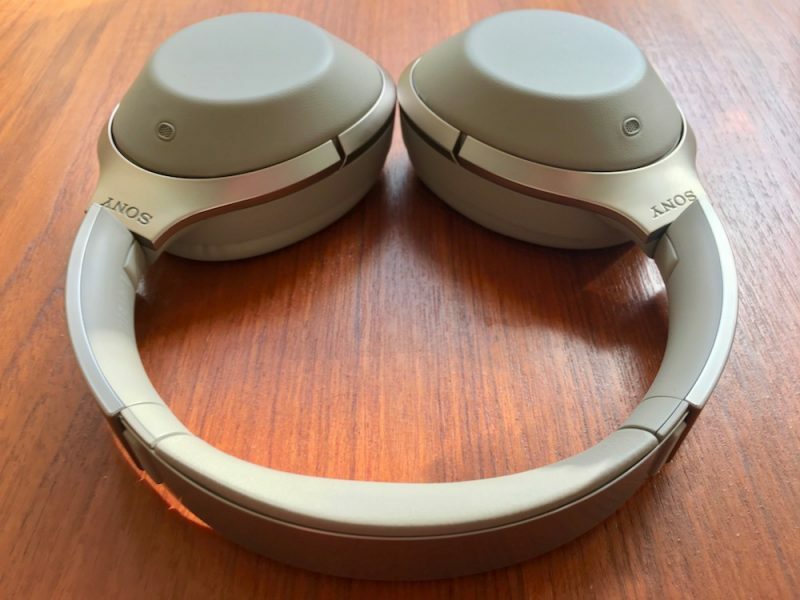 Sony's headphones certainly have a stronger Bluetooth connection than the competition – the MDR's didn't drop out once in areas where rival Bluetooth headsets I've tested regularly faltered. The link was retained around harder corners and over bigger distances – the MDR-1000X's even passed the 'microwave test' and didn't get all glitchy as I hovered around the kitchen while my dinner was being nuked. Wireless audio connections have their limits of course, but Sony has also included a neat sound prioritization feature in the MDR-1000X that I haven't seen in other cans. By default the headphones automatically select the highest quality Bluetooth protocol available, but hold down both power and NC buttons for a couple of seconds and you can switch them to "Priority on stable connection" mode, which falls back to the less-demanding SBC codec. Bear in mind I've no idea how well it works because I never had to use it. On the subject of wireless codecs, this headset supports them all: AAC (iPhone), aptX (Mac/Android), SBC (everything), and LDAC. That last one is a Sony special which apparently transmits up to three times more data than conventional Bluetooth for superior sound, but it only works with Sony devices, such as the company's Xperia smartphones and Walkman digital audio players. There's some proper science behind it and I have it on good authority (an audiophile friend) that it delivers on its promise, but I didn't have any other Sony hardware to test it with. To be honest though, it didn't bother me. The MDR-1000X's sound brilliant over bog-standard Bluetooth anyway, and certainly outperform the QC35's thanks to a wider, more expansive soundstage. The mid-range is wonderfully balanced and the highs sparkle, while a good, chunky bass serves as a warm foundation. They sound even better when the cable is used – so long as the headphones are on. Whether this is all down to Sony's DSEE HX processing (which allegedly recreates higher frequency signals lost in low-quality compressed music files) or simply better tuned drivers, I can't say. Whatever the reason, the MDR-1000X's sound fantastic, especially for NC cans. A few other points bear noting. Unlike the QC35's and PXC 550's, Sony's headphones don't seem to be able to pair with more than one device at the same time. I had to manually disconnect my iPhone to reconnect with my Mac, and vice versa, despite the fact that the cans had no trouble auto-pairing with the last known device when turned on. Also, the 1000X's live up to their 20 hour battery life, but they take 4 hours to fully charge – twice as long as Bose – and the battery is similarly integrated, so it has to go back to Sony if/when it comes to replacing. Sony has pulled a fast one on its rivals here. For a company whose last serious attempt at noise canceling was the h.ear on Wireless NC headphones, the MDR-X1000's are a huge step up in performance. 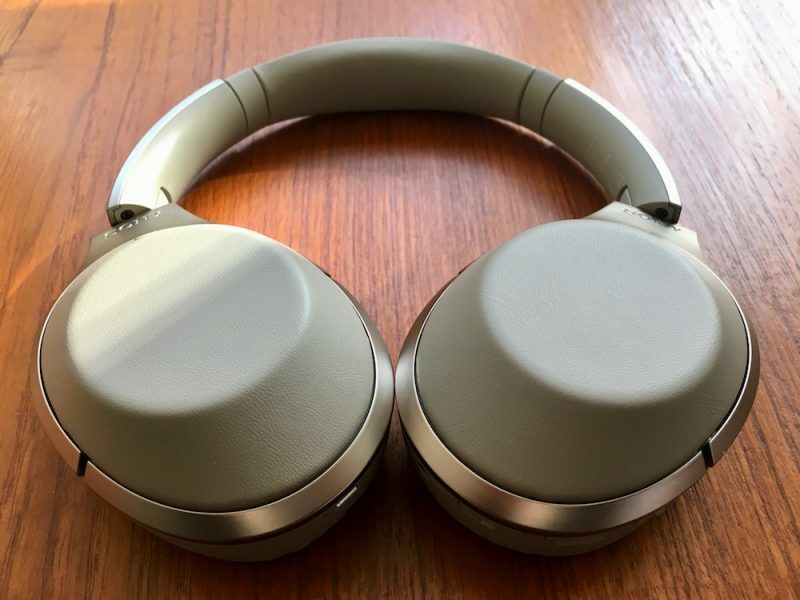 Not only do they look smart and block out distraction, they also pack a ton of technology (not to mention compatibility), keep a strong connection, and deliver a beautiful sound. It's a sure sign that the premium NC market is maturing, and that translates to better consumer choice. For those who favor comfort, always-on NC and listening simplicity, Bose still wins. If a bigger sound and the ability to switch between multiple audio sources are your top considerations, Sennheiser's PXC 550 cans are a great alternative. But if superior noise canceling and audio quality are more important to you than cushiness and dynamic pairing, then these new MDR-1000X headphones from Sony have your back. 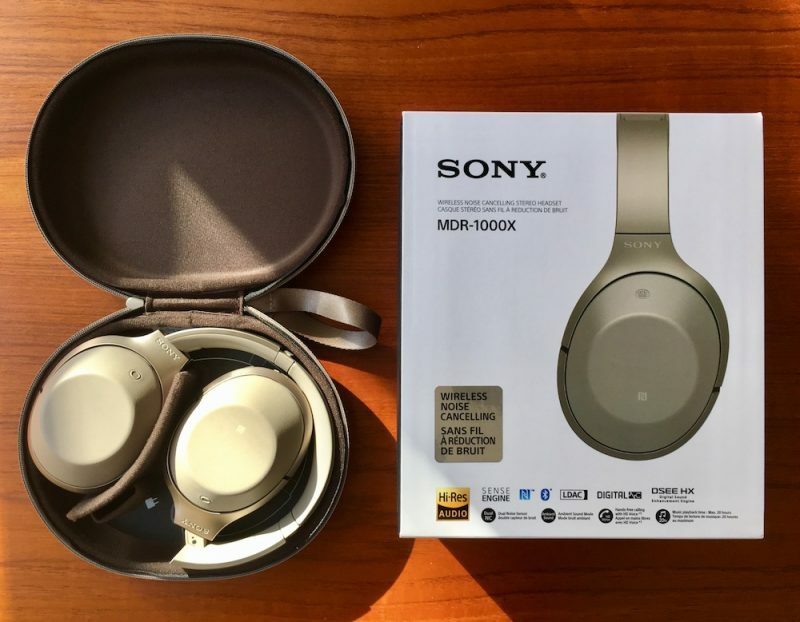 The Sony MDR-1000X headphones come in beige or black, cost $400, and can be ordered via the Sony website. Note: Sony supplied the MDR-1000X's to MacRumors for the purposes of this review. No other compensation was received. Sticking with Bose, they sound fantastic and very comfortable. No they dont sound fantastic. Guys i have the QC35s with an iphone. It sounds very flat and dull. NC is good but not great. OP - can you tell us you would choose these sonys over the Bose? how is it on the plane and voices? For some reason i can still hear people yapping on the plane with the QC35s. No W1 easy pairing process is gonna be a shame. Eventually buyers will come to expect that ease. After owning the QC35's since launch, I thought this would be an easy comparison with one clearly besting the other. So not the case and anyone's choice here is not necessarily an easy one. Fit and comfort - The Bose are very light. The cups are big and will easily fully surround each ear. You hardly realize the headphones are on. That said, the Sony's are definitely comfortable as well and for me seem to make a tighter seal. For a day at the beach or using the headphones during a commute I might lean towards the QC35's as they are a bit lighter. Connectivity - This one is easy. The QC35's ability to connect to multiple devices via Bluetooth and the ease at which they switch between devices makes them a clear winner here. Noise Cancellation - This is technically a draw with the slight edge going to the Bose simply because you can hear the NC engaged on the Sony's when not listening to music. Sound Quality - Here is where the rubber meets the road. The QC35's never sounded great to me at first listen. Over time I have gotten used to them. They tend to sound thin as if they were EQ'ed so that every instrument was given the exact presence in the mix. I've used sterile and seen clinical in describing the SQ. That seems to be a great word. You listen and hear the music but it never really engages you. It's all very flat. The highs also seem brittle. That said, I do like that the sound is not scooped in the mids. The first thing that came to mind when listening to the MRX's was that they have that "Sony" sound. This is not necessarily a bad thing but it doesn't mean they sound neutral either. The sound is definitely more engaging and beefier. Here the mids are a bit scooped with the bass and treble having some more presence. Unlike the Bose, the Sony's are definitely engaging. The sound is there and if that mids were just given a little more edge these would be perfect..for me. I did listen to the Sony's with NC turned off. I found them to sound better with NC On, especially at lower volumes. Conclusions - If I was choosing between these without owning one or the other I would go with the Sony. SQ is the bottom line for me and they make up enough of what bugs me about the Bose to make them the easier choice. I own the QC35's and was thinking about selling them but now I'm not so sure. Listening to music on my phone in bed while reading my iPad and occasionally switching to YouTube is a snap with the Bose. The on/off switch is easily accessible and they feel great. Unless you are dissatisfied with the SQ of the QC35's the only real edge the Sony's have is in the Sound Dept, but make no mistake, there is a difference. Who the hell comes up with these stupid names? I've had the MDR-1000x and QC35 together for a little over a week now. I've owned the QC35 for a couple of months now and I picked up the Sonys a little over a week ago. I should also note that I have the New Bose QC30, as well as the Bose QC20i which I've had for a little over a year now. I will give you my ranking between the QC35 and MDR-1000x based on Sound, Comfort, Noise Cancelling, Features, and Design. This is really not close for me. The Sonys are Clearer, More Detailed, Tighter, More Musical, and Plays louder on my Ipad Pro and Iphone 6S Plus. It's honestly the best sounding Bluetooth headphone I've heard, just beating out my previous favorites, the Sennheiser Momentum 2.0 and V-Moda Crossfade Wireless. The only area where the Bose wins for me is in the Sound Stage. The QC35 does have a deeper and wider sound stage. Instruments for Acoustic music have more space around them. This can be good for some music, but causes more energetic music to sound kind of boring. I also like the Dynamic EQ on the QC35 that adjusts the EQ based on the volume. I find it useful in certain situations. Mainly when I'm in bed next to my wife at night watching or listening to something exciting on my iPad and I need to keep the volume lower. Keeps a level of excitement at the low volume. The results here are different for me than many. I have small ears and I can wear both of these headphones for hours with no discomfort. The Sonys have a snug fit. Feels more secure on my head. The pads work better with my glasses than on the Bose. However, the Bose have wider openings in the ear cups that completely surround my ears. The padding on the headband of the Bose feels ever so slightly more comfortable. The thing with these headphones for me is I prefer the comfort of one over the other in different scenarios. If I'm sitting down at a desk, or on the couch, not doing much moving, Bose wins. You do forget you're wearing them. If I'm moving around, doing work around the house, or walking the dog, I prefer the Sony's as they fit more secure on my head. The Bose moves around a little more on my head than the Sony's. I was really considering declaring this category a draw, but after further consideration, I'm going to give the slight edge to Bose on this. I do most of my listening with these headphones sitting down as I tend to use my QC30 when I'm more active. It's really close though. I wear glasses and have tested both with glasses and without. With glasses, after running Sony's Optimizer (An amazing feature by the way), they clearly best the Bose. It really is amazing how well this feature works. I honestly thought it would be a gimmick. I can't explain how they do it, but this is the first pair of noise cancelling headphones I've ever used where I didn't feel like I needed to take my glasses off to get that little bit of extra silence out of the headphones. Remarkable! Bose has always struggled with my glasses for me, which is the reason I even got into their noise cancelling earbuds to begin with. Now when I remove my glasses, which is how I assume most wear noise cancellers, it's very close. However, one thing gives the Sony's the edge for me, high frequency noise cancellation. The Sony's cancel the sound of silverware banging together, running water, voices, and other sudden higher pitch sounds better than the Bose do. They both bring the bass from my home theatre system to a near whisper, and I'm hard pressed to tell a difference. I will say that I've only tried the Bose in the Air so I can't compare the two for airline use. With these facts, I'm currently giving the edge to the Sony's assuming they're comparable to the Bose in the Air; which every review I've read state that they are. Sony has the Noise Cancelling Optimizer, Touch Controls, and Awareness Modes. You can use the Sony's with Noise Cancelling on or off in both Bluetooth and Wired Mode. Bose has Voice Prompts and Dynamic Multi Device Switching. Most say the Sony's, I say it depends. The dynamic multi device switching that the Bose offers is a very big deal, and in my opinion the best feature out of all the devices. I mean, being able to connect to my iPad Pro and iPhone at the same time and have sound played from each one without going into settings or repairing through the headphones is a huge deal. For me, I'm going to give the slight edge to the Sony's for 2 reasons, first, the Noise Cancelling Optimizer is a God send for me and my glasses. I finally can wear Noise Cancelling Headpohones and never feel a need to remove my glasses. Second, I own the QC30s which offer the same Multi Device Dynamic Switching the QC35s do. So the feature is available for me. I've never been big on design or build quality. Both look decent as Consumer style headphones, and both feel premium, although in different ways. For me it's hands down the Sony MDR-1000x. It has better sound and noise cancelling with my glasses. Sound and Noise Cancelling are what matters for me most with these two headphones, and the Sony's win in both. Owning the Bose QC30s actually make it even easier to choose the Sonys for me. If I didn't own the QC30s, I could see it maybe being a little tougher to decide simply because of some of the features the Bose offer that the Sony's don't, as well as the amazing comfort. Your mileage may vary, and I encourage each person to try out both if trying to make a decision. Well, sound quality is subjective so I really recommend you find a place you can test them both out. You might prefer the things I don't like. And to be fair, they both sound pretty good. But to my ears, the Bose had a bit harsher treble. They were also a bit muddy on the low end (not terribly so, though. For some genres you might prefer it that way). 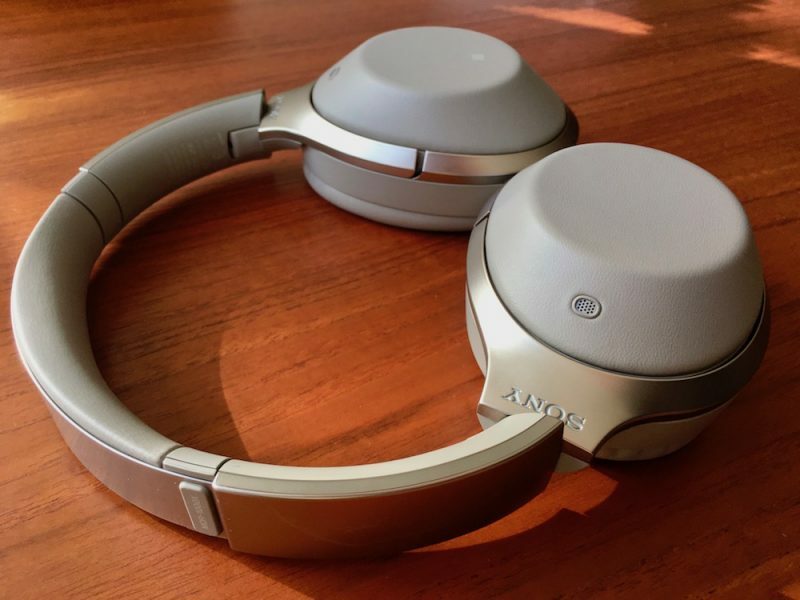 The Sony's, on the other hand, are quite a bit warmer sounding and have very smooth treble, which means you probably won't get sound fatigue after listening for an extended period. Honestly, it just seemed to me the Sony's were more meticulously tuned. On the other hand, the Bose had a bigger soundstage, meaning the instruments sounded a more separated from each other than they do on the Sony. So, that's definitely a win for Bose. Overall, however, I prefer the Sony's sound. It's also worth noting that the Sony's noise canceling is better, so if you're getting headphones for that reason, get the Sony's. The build quality is better, too, though at the expense of weight and some comfort. Sony does execute with their sound. These are on my wish list. If I wanted to plug these into something, say a port in my phone and my laptop, I wonder, what will it look like in the future? It has to be about 3.5mm, this is kind of the perfect size.